This morning I walked the Birks of Aberfeldy before settling down to work. It was a bright, chill late April morning. Despite the previous week in which I’d suffered sunburn, this morning the frost nipped at my fingers and snow had settled low on the surrounding hills. I am fortunate to have a place on my doorstep that nurtures my writing. My words demand to be set down when I spend a lot of time wandering about in the place that generated them. I wrote my novel, Call of the Undertow, by repeatedly walking the beach and dunes at Dunnet Bay and cycling the lanes that radiate from it. In this way my characters got themselves entangled with local stories, geographical features, storms and sunsets. I didn’t actually write it in motion but the ideas came with the visceral sensations of being in that place, got scribbled down on the move, and later materialised into scenes. It’s in motion that I notice things most acutely and make links between apparently disparate things. 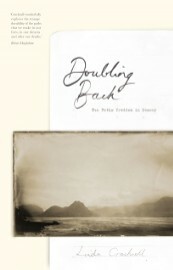 I started writing Doubling Back, my first serious foray into non-fiction, partly because my fiction writing was becoming so physically embodied in places and landscapes. If I had to walk to write, why not write about some walking journeys which fascinated me because of the weight of memory-mud they left clinging to my boots? The Birks of Aberfeldy inspired the final essay in Doubling Back. Because this short journey is so reassuringly familiar to me, the path here acts as an effortless metaphor for home. I set off with Doubling Back both on foot and on the page in 2007 with the support of funding from a Creative Scotland Award and quite quickly walked up a full length manuscript of ten journeys. It was shortlisted for the Robin Jenkins award for environmental writing in 2009. The fact that it wasn’t ready to be published until May 2014 tells another story, not of a major new walks added or journeys re-trodden, but the long and convoluted process of revising and restructuring. This isn’t a complaint about revision; each new circuit of an essay allows me to relive the journey and savour again the details in a way that an act of recall itself would not evoke so vividly. But for me, the time taken to batter and hone an essay into a readable shape takes many times the length of the experience itself. And that’s not to mention the work in making essays cohabit and iterate within a meaningful-feeling book. Non-writing friends and acquaintances picture me stomping across moors, up hills, following drove roads and poetry paths as my ‘normal’ occupation. Conversely I picture myself mostly developing cramped shoulders and sciatic pain from sitting still too much and missing out on all the outdoor fun others are having, reflected back to me on Facebook. What cruel irony! Far from keeping me out of doors and active, getting Doubling Back fit for publication largely kept me at that desk (admittedly a month of it in the delightful setting of Lavigny International Writers’ Retreat in Switzerland). Fortunately for this oh-to-be-outdoors-writer who spends so much of her time staring wistfully out of the window, the famous hour-long walk a stone’s throw from my home has shown itself able to ‘stand in’ for some of the impulses which originally moved my pen. The walk resuscitates me, reminds me of moving in that big outdoors and clicks things back into perspective. It’s not that my regular visits are a substitute for a fifteen-day walk along a drove road or the pursuit of my long-dead father up a white Alpine slope. But it returns me to the rhythms of walking, the breath and pulse and the meaning found in the buds about to spring open, or an old road trailing a faint depression across a hillside. During rewriting, such reminders regrounded me in those stories. The path has been a companion and memory-bank and vehicle, exercising my imagination and my emotions as well as my body. Despite the familiarity, the place still offers fresh and unexpected observations. With its climb up a woodland ravine to a waterfall, it gives me a good physical workout as well as being a route layered with previous footfall invoking story and memory. I may walk it early in the morning before I settle to work, as today, or in the dopey hour after lunch, or to celebrate the end of the working day. If I’ve been at my desk, I nearly always need to lighten up. This morning, two red squirrels shimmied at speed up dual-carriageway tree trunks, inviting me to look up into the high canopy and making me smile. A small face peered over a branch as if ready to pelt me with victor’s nuts. If I need to reconnect to humanity, there are nearly always other walkers, rarely passed without a greeting or an exclamation of joy or weariness. And there is Burns and his song to remind me of the role of a writer. 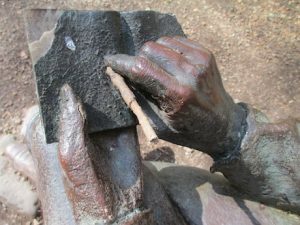 His statue’s been sitting in a clearing since 1998, composing on the spot with notebook in hand. As I reached him this morning, I saw that since I passed him the day before, someone had filled the gap made by his long-ago-stolen pencil with a small twig. As I continued on the well-trodden path, my cares started to fall back with the accompanying chuckle of the burn and the birds. My body clicked into its two time rhythm, the breath flowed in and out, and thoughts meandered between inner landscapes and actual observation; between the uneasy presence of two owls in a short story I’m revising that aren’t sure why they are there, and the rubbery-feeling of young beech leaves that are backlit almost translucent yellow against the dark wintry brush. It brings me back to what generates the words, what sparks the imagination. Higher up the path, climbing out of the dark low crevice and after the zigzagging tiers of steps, came a reminder that despite the car park, the signs warning about trips and slips, this is still a place at nature’s mercy. Over the winter, burns pouring down the steep walls of the ravine have gouged new ways with their white water, shifted rocks, dumped tangled branches between boulders. Toppled trees hung with lichen were angled across gaps in the foliage. After the bridge crossing the waterfall I came to a summit of sorts, and broke out of the trees to a mountain-cold blast of wind from the West. It’s high enough here, at nearly three hundred metres, to make me feel lifted out of the everyday world, shown a more encompassing perspective; the sort of perspective so valued by mountaineers. And I can look into the western hills and imagine setting off through the gaps between them carrying a full backpack and a map. A deep breath flowed in and out. Schiehallion was revealed, white and sharp on a long jagged horizon. The Tay valley sliced across my view below with its mixture of wild and tame; pylons reminding me of power generation and its implication of home, but the valley also revealing the roads that take me away from here. The town crouched by the river Tay where I know that oyster-catchers are piping again. One of the houses down there contained my worries and deadlines and creative confusions, and in just one room was the laptop I abandoned within the last hour in favour of this creative replenishment. And so I re-turn this circuit again and again; take a break, stretch my legs, remind myself why I write, what I write, and how it arrives, complete with whatever sensations the season offers; this time the green flare of new leaves and the hoot of wild garlic. Linda Cracknell is a writer of fiction, creative non-fiction and radio drama. Recent books include a novel, Call of the Undertow, and non-fiction Doubling Back: Ten Paths Trodden in Memory. She teaches and facilitates creative writing in a variety of settings at home and abroad. In June 2012, she started a two year residency with the Sick Kids Friends Foundation in Edinburgh and was joined by illustrator Cate James in January 2013.